President Obama enters the seventh year of his presidency in a familiar position when compared with his recent predecessors. His 47% job approval rating places him squarely between George W. Bush (33%) and Bill Clinton (63%) at similar points in their second terms. Obama’s rating is comparable to Ronald Reagan’s in January 1987 (49%), when Reagan was embroiled in the Iran-Contra affair. The latest national survey by the Pew Research Center, conducted Jan. 7-11 among 1,504 adults, finds that Obama’s job approval has risen five points since December (42%). 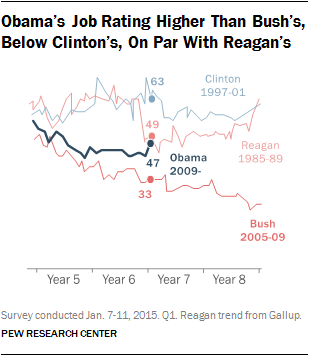 The president’s job rating changed very little over the course of 2014. Obama is being helped by a steady improvement in public views of the nation’s economy. 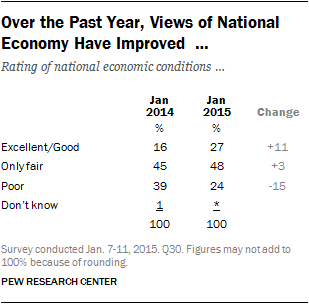 Currently, 27% say the economic conditions are excellent or good, up from 16% a year ago. Perhaps more important, almost twice as many expect the economy to be better than worse a year from now (31% vs. 17%). For the first time in five years, more Americans say Obama’s economic policies have made conditions better (38%) than worse (28%); 30% say they have not had much of an effect. And Obama engenders more confidence on the economy than do the leaders of the new Republican majority in Congress. The percentage of Americans who say the economy is doing well has increased by 11 points since Obama’s last State of the Union in January 2014. The percentage rating economic conditions as ‘poor’ has fallen 15 percentage points over the same period. Moreover, 36% say there are plenty of jobs of available in their communities, among the highest during Obama’s presidency. Yet there has been no change in perceptions about whether incomes are keeping pace with the cost of living. 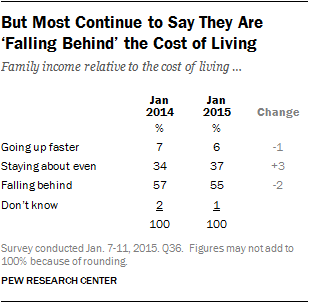 Currently, 55% say their family’s income is ‘falling behind’ the cost of living; 37% say they are ‘staying about even,’ while just 6% say their incomes are going up faster than the cost of living. In January 2014, 57% felt as if they were falling behind financially. 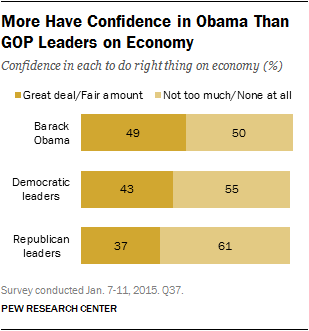 Obama Draws More Confidence Than GOP Leaders on Economy. Overall, about half of Americans (49%) say they have a great deal or fair amount of confidence in Obama to ‘do the right thing’ in dealing with the economy, while 50% have not too much confidence or no confidence at all. That compares with 43% who have at least a fair amount of confidence in Democratic congressional leaders, and 37% who express confidence in GOP leaders on the economy. Outlook for New Congress: More Partisan Bickering. As recent Pew Research Center surveys have found, the public has very low expectations for partisan cooperation in the coming year. The new poll finds that 71% think Republicans and Democrats in Washington will ‘bicker and oppose one another more than usual.’ Just 22% say they will work together more. Shortly before Obama took office in 2009, only 39% predicted more partisan bickering. Nearly Half Disapprove of GOP Leaders’ Plans. Currently, 40% approve of Republican leaders’ plans and policies for the future, while somewhat more (49%) disapprove. Shortly after the midterm elections, when Republicans gained full control of Congress, about as many approved as disapproved of GOP future plans (44% approved vs. 43% disapproved). The public has mixed opinions about whether Republicans will be successful in getting their programs passed into law; 45% say they will be successful, while 46% say they won’t. Obama Seen as ‘Not Tough Enough’ on Foreign Policy. Most Americans (55%) continue to say that Obama is not tough enough in approaching foreign policy and national security issues. Just 37% say his approach is about right, while 5% say he is too tough. These views are little changed from last August (54% said Obama was not tough enough) and November 2013 (51%). Concerns Over Closing Guantanamo. Obama has long sought the closure of the U.S. prison holding terrorist suspects at Guantanamo Bay, Cuba. 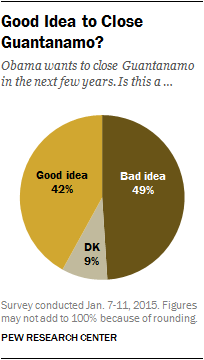 More Americans think closing the prison in the next few years is a bad idea (49%) than say it is a good idea (42%). Republicans overwhelmingly say that closing the prison is a bad idea (80%), while 64% of Democrats think it’s a good idea. Public Divided Over Tougher Economic Regulation. As the new Congress debates rolling back some provisions of the Dodd-Frank economic regulation law, the public is evenly divided over whether the government has gone too far (45%) or not far enough (47%) in regulating financial institutions and markets. There also is a stark partisan divide in these attitudes – 64% of Republicans say financial regulation has gone too far, while 61% of Democrats say it has not gone far enough.